Addresses the myriad issues faced by health care facilities when it comes to gathering, maintaining and using confidential health information. Since it was first published in 1984, this book has become the leading authority and the standard desk reference in the Canadian health system. 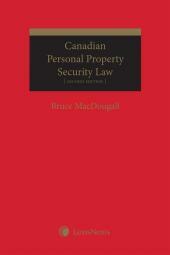 The authors address the various issues that health facilities face when dealing with gathering, maintaining and using confidential patient information and provide an overview of the provincial and federal access and privacy legislation that applies to health information in the public and private sectors, including the Personal Information Protection and Electronic Documents Act. They also provide guidance on best practices for implementing appropriate policies and procedures. 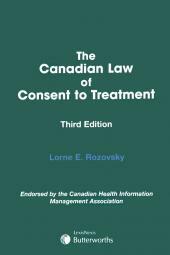 The late Lorne E. Rozovsky, Q.C., was the author of a number of books, including the first volume published on Canadian hospital law, Canadian Healthcare Forms & Policies and The Canadian Law of Consent to Treatment, 3rd Edition. He also authored more than 600 articles on health law. He served as a consultant to health organizations and government agencies, as well as the faculties of law, medicine and dentistry at Dalhousie University. Noela J. Inions, Q.C., B.Sc.N., LL.M., is Senior Legal Advisor to a federal Crown corporation that conducts business on a global platform. She served as Chief Ethics & Compliance Officer for Alberta Health Services for eight years. Noela was also General Counsel and Registrar, Lobbyists Act, in the Office of the Ethics Commissioner of Alberta and Legal Counsel and Adjudicator in the Office of the Information and Privacy Commissioner of Alberta. She has worked as a registered nurse in both Canada and the U.S.
Leanne E. Tran, B.Sc., J.D., M.D., is a health lawyer and principal at JD MD Solutions, which offers services at the interface of law, medicine, science and research with expertise in contracting, regulatory, IP, commercialization, data security, privacy and risk management. She is counsel and advisor to health sector organizations and she sits on several boards of non-profit health care organizations. Leanne has published, written and spoken extensively on medical and legal matters in Canada. 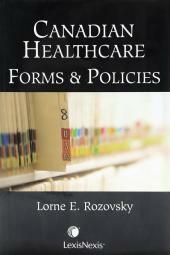 Chapter 3: What is Health Information?